WOW, what an experience I am having with this beautiful Big Sister Loom with the No Warp-Ends Kit from Mirrix Looms! I have to say that I have done some loom work beading before, but never anything like this!! The ease of tightening the tension when it needs it, moving the legs to adjust the height and angle or just the clean lines of the loom is amazing to me!! The Mirrix Looms Company just celebrated their 20th year and it is easy to see why so many people love them!! Here is 65 rows and 5,720 beads! I am so happy with the way that this beautiful loom work is coming along!! I just can’t believe how much better ‘curves’ turn out in this stitch!! If you have been watching, then you know that I have been moving along with the pattern. I know it is slow, but you have to remember that every photo I show you is another 440 beads!! As I am working along I keep thinking about how wide this Big Sister Loom from Mirrix Looms is!! Do you know how wide I could make some of these designs? And then, because it is adjustable UP….I can also go tall….hum….I am thinking of designing a new pattern…hum!! But, for now, here is row 80 (7,040 beads so far) and where I start off this morning! 145 rows and 12,760 beads so far! I am done!!! Just look at this finished creation!! his is my second creation using my new Mirrix Loom as part of the Mirrix’s 2016 Social Marketer Program. This time I used the No Warp-Ends Kit and enjoyed every minute of it!! The originals artwork is by by Katerina Art (Katerina Koukiotis). For many years I have loved/collected her artwork and was thrilled when she said that I could use this as one of my designs! I had so much fun with this design!! Adding the believe and ‘little’ details to the finished artwork just seemed to be perfect!! There was approximately 47 hours of beading and designing in this creation. The frame is sized at 7.5 x 13.5 inches. I just love the way it turned out! But I have to show you something….remember I used the No Warp-Ends Kit on my Big Sister Loomfrom Mirrix Looms. Well, I was VERY unsure (in my mind) about how this would work!! 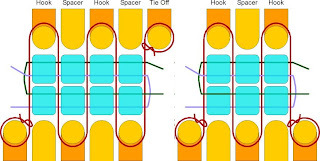 I totally understood how to warp the loom when I started, but what really concerned me was the part of the weaving on the first couple of rows where there is a ‘spacer’ on this graphic! Now, logically I understand that the threads will hold in the beads…but in my mind I just can’t get it to understand how the beads that are in the ‘spacer’ section will not slide right off once the ‘paperclips’ are removed!! I know, it is all about tension and the threads of the weft…..but…. So, once I was done last night I had to take a quick walk (to gain courage) and then come back and start to remove the paperclips from my project….here I went, with a project with 14,520 beads in it….holding my breath that it will work…and then…. It WORKED!!!!!!!!! I was so amazed! Now, I knew in my mind it would, but….. and with a little bit of ‘rubbing’ it turned out perfectly! !